it is one of the most intriguing circuits that will ever be studied. It is not human-made. What is now the human brain has grown three times in size over the last two million years. Ever-growing social competition forces the brain to evolve and grow larger. It also remains unparalleled in functions like intelligence compared to other animals. Prelimbic cortex, prefrontal cortex, dorsolateral striatum, dorsomedial striatum, hippocampus, ventral striatum and the right parietal lobe this is not Greek, just the brain regions that make a Homo sapiens human. Scientists are yet to map the way they are wired into a network of intelligence. "The human brain is estimated to have 100 billion neurons or nerve cells. Each neuron can be connected to thousands of others.This is a lot of information to measure and understand," said Partha Mitra, a neuroscientist with the Cold Spring Harbor Laboratory, usa. Mitra and his team are mapping the mammalian brain. The details of the ambitious project are in the March issue of PLoS Computational Biology. Recent forays into this complex orchestra of emotions, feelings and cognition help put a few pieces of the map together the neural circuits of the brain decide how smart a person is, how warm-hearted the person will be and how selfless his or her actions are. It is again connections in the brain due to which some take rare chances in life while others look back and sigh. The intricacies do not end here. Stress kills brain regions that help a person take decisions after careful analysis. So if the person does not wish to keep pressing the same elevator button for the rest of his or her life, he or she should try stress-busters. Dancing is good. The brain should not be left idle either. It is the devil's workshop. It could lead a child to talk, walk and fidget around restlessly--commonly called the attention deficit hyperactivity disorder (adhd). A team from Oregon Health and Science University (ohsu) in the US found several regions actively at work inside the idling brain. Distinguishing the functions of an idling brain from those of an active one will be helpful in detecting this difficult-to-diagnose disorder, said Damien Fair from the ohsu School of Medicine ( PLoS Computational Biology, May 2009). But even adhd does not compare with the grey menace--the seventh leading cause of death in the world. 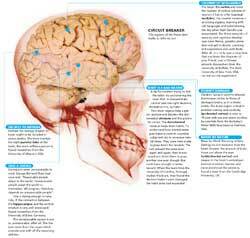 More commonly called Alzheimer's, an estimated four million people in India suffer from it. A good bit of research has gone into it. Alzheimer's affects the hippocampus. This region deals with memory. In some people the hippocampus gets tired of keeping track of the zillions of things life unfolds everyday. As it gives up overworked, people develop Alzheimer's. New research says signs of exhaustion are shown by the brain decades before the actual symptoms appear. In an article published by the April issue of the Proceedings of the National Academy of Sciences, a team from the University of Oxford identified hyperactivity in the hippocampus of young, healthy people. These people carried the apoe 4 gene which has been found in people who had Alzheimer's. The team is the first to show that this gene makes the brain work even when it is at rest, thus exhausting it. But the brain even in an Alzheimer's patient is tougher than was known. The damaged nerves still manage to transport enough information to keep the patient alive longer than he or she could have stayed. They are almost like electrical wires which are frayed and worn out but can be connected to the main circuit. There is a loss of information but transmission does take place. In the brain of an Alzheimer's patient, the wires are frayed to a much larger extent. So if therapy can be devised to improve the connectivity, the patient can recover partially (Brain, December 2008). "Even though new magnetic resonance imaging techniques are here, we will never understand the brain in every detail. But we can understand better its functions, how it relates to decision-making in everyday life and brain diseases," said Bernd Weber, doctor from the University of Bonn, Germany. "What makes the human brain even more complex is that it varies from individual to individual. So it is both hopeless and meaningless to map every detail of an individual brain," explained Mitra. But researchers are undeterred by the difficulties. An injectable gel developed by a team from the Clemson University, usa, helped a rat recover from brain injuries. It has hope for humans. The team presented its find at a research forum in Kansas city, usa, on September 2. Henry Markram, neuroscientist from the Brain Mind Institute in Switzerland, claims a biological model that can replace the "trillions of synapses, billions of neurons and millions of proteins" is possible in 10 years. Markram and his team have named it the Blue Brain Project.